This work is a revision of the scarab beetle genus Euphoria Burmeister (Coleoptera: Scarabaeidae: Cetoniinae) and is based on the examination of 18,880 specimens from 67 collections. Based upon a character study of all specimens examined, the genus is divided into 14 informal species-groups: areata species-group, avita species-group, biguttata species-group, candezei species-group, discicollis species-group, fulgida species-group, geminata species-group, hera species-group, herbacea species-group, histrionica species-group, inda species-group, pulchella species-group, sepulcralis species-group, and verticalis species-group. A description, a diagnosis, adult temporal occurrence, and geographic distribution are presented for each species. Maps of distribution and illustrations of key characters are also included. Bilingual (English and Spanish) keys for the species-groups and all species are included. 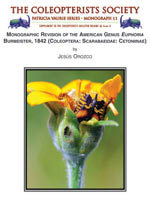 Euphoria now includes 59 species, ten of which are here described as new species: E. canaliculata Orozco, E. diminuta Orozco, E. hidrocalida Orozco, E. lacandona Orozco, E. levinotata Orozco, E. mayita Orozco, E. montana Orozco, E. nicaraguensis Orozco, E. paradisiaca Orozco, and E. vittata Orozco. The following combinations are placed into new synonymy: E. acerba Janson (= E. steinheili Janson), E. atra Bates (= E. humilis Blanchard), E. comminuta Casey (= E. chontalensis Bates), E. fascifera trapezium Casey (= E. fascifera LeConte), E. fuscocyanea Casey (= E. fulgida (F.)), E. hoffmannae Deloya and Nogueira (= E. monticola Bates), E. holochloris Fall (= E. monticola Bates), E. leucopyge Bates (= E. dimidiata (Gory and Percheron)), E. limatula Janson (= E. sepulcralis (F.)), E. lineoligera Blanchard (= E. biguttata (Gory and Percheron)), E. longula Casey (= E. eximia Bates), E. morosa Janson (= E. abreona Janson), E. nigriventris Bates (= E. humilis Blanchard), E. nitens Casey (= E. sepulcralis (F.)), E. precaria Janson (= E. abreona Janson), E. rufina (Gory and Percheron) (= Euphoria leucographa (Gory and Percheron)), Euphoria scabiosa Casey (= E. sonorae Bates), E. submetallica Casey (= E. yucateca Bates), E. testacea Casey (= E. leucographa (Gory and Percheron)), E. trivittata Nonfried (= E. steinheili Janson), and E. vazquezae Deloya and Woodruff (= E. candezei Janson). The following names are raised from synonymy and are considered valid species (new status): E. leucographa (Gory and Percheron), E. limbalis Fall, E. vestita (Gory and Percheron), and E. yucateca Bates. Lectotypes are designated for the following species names: Cetonia canescens Gory and Percheron, C. dimidiata Gory and Percheron, C. latreillei Gory and Percheron, C. lesueuri Gory and Percheron, C. lineoligera Blanchard, C. pulchella Gory and Percheron, C. submaculosa Gory and Percheron, Euphoria acerba Janson, E. andina Schein, E. candezei Janson, E. hera Burmeister, E. leprosa Burmeister, E. punicea Janson, E. steinheili Janson, E. verticalis Horn, Stephanucha bispinis Bates, and S. thoracica Casey. A neotype is selected for E. sonorae Bates.